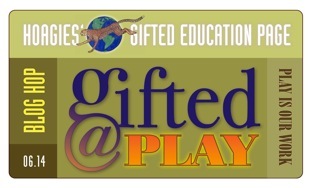 This month, Hoagies' Gifted Education Page shares our Blog Hop on Gifted @Play. Bloggers from all corners of the gifted community--parents, teachers and counselors, from the U.S., Europe, Australia and New Zealand--join us to share their perspectives on play: outdoors, indoors, creative, active, child, teen and adult. Don't miss last month's inaugural Blog Hop, The "G" Word. If you'd like to join our next Blog Hop, contact us at webmaster@hoagiesgifted.org. Special thanks to Pamela S. Ryan for our Blog Hop graphics! Find great toys, games and puzzles for gifted kids @play on Hoagies' Smart Toys & Games (and Adults! ), including Smart Family and Party Games, Smart Hands-On Toys and Puzzles and Smart Word Games, and more! LEGO® are definitely an ingenious multi-use toy that has stood the test of time. 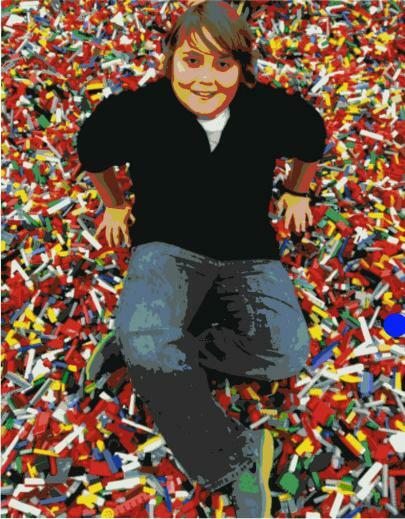 The thoughts and ideas of what one can do with LEGO® keep building and growing, one idea upon the next, exponentially: construction, learning, Math, Science, art, music, transportation, engineering, robotics, Geometry, parks, stores, events…. oh this list can truly be endless. Endless possibilities, just like the toy itself! The most interesting thing is that, once they start playing, it's hard to make them stop. Not because THEY don't want to stop, because I don't want them to stop. It's utterly mind-boggling what seeps into their play. Kid One: Let's divide all these dominoes...hey, that's just like division!